Sunday was all set to be a slightly more laid back affair, still plenty to see and do but without the need for the superhuman omnipresence demanded by the previous two days. I starting the day by visiting Siren, to enjoy my morning brew and make designs for the day ahead, the Baltic Triangle still resonated with echoes of the previous night's madness. Siren itself is a striking, glass fronted building with a spacious and rather beautiful atrium holding the day's stage. I had little more time than it took to appreciate my cuppa before I had to be on my way however, but I knew I would be back shortly. 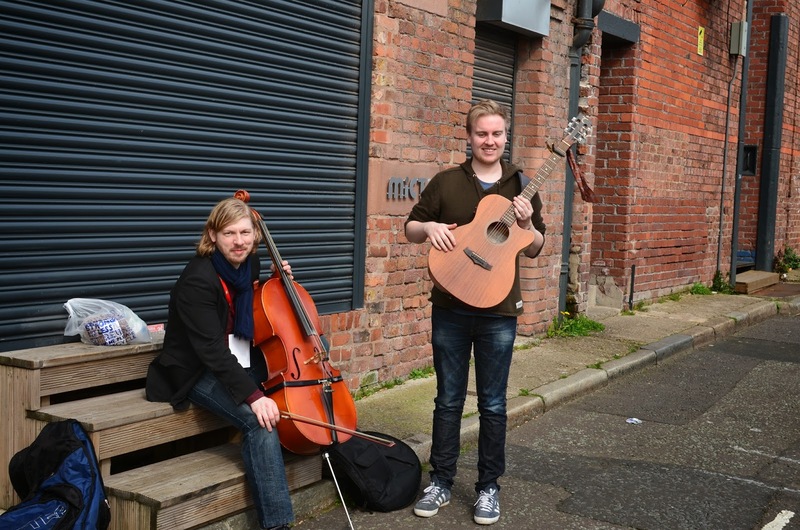 Legging it down to the Baltic Bakehouse, I passed Andrew AB filming Silent Cities on the corner of Watkinson Street with cellist Luke Moore, but after sharing little more than a quick hello I had to continue on my way. The Bakehouse was the venue for the Homegrown Banana's stage today, and hosting a vast wealth of talent from the Wirral, and outlying areas. Modest in size, the long café interior was packed with stage facing seating and faces smiling in anticipation. I helped my good friend Joseph Crawford aka Creaky Bones (pictured) with his gear onto the diminutive stage, that was further dwarfed amidst his drums and guitars then took my seat amongst the crowd. A monument of positivity and creativity in performance, Creaky Bones never fails to transfer his wicked smile on to his audience as he plays. A short, sweet set encompassing slide guitar covers from Muddy waters to the White Stripes, as well as a number of original compositions displaying a wealth of talent in a defining moment in his musical uprising. The stage saw some incredible and intimate performances from the likes of the blues infused duo Groundhog, flawless songstress Jo Bywater and the inimitable, raucous Rufus Hok, intermixed with some brave and awe inspiring spoken word performances throughout the afternoon. A hop, skip and a jump back to Siren I had the opportunity to take some time with two more good friends, Andrew Jones and Liz Owen of Just by Chance sampling the local beers and preparing for their set. Before the musical schedule began we were treated to a short and peculiar rendition of Alice in Wonderland by a cast of local college students. Hindered perhaps by the irregularity of the venue's available space, the cast didn't let that stand in the way of a meritable and comical performance that was certainly enjoyed by the smattering of patrons. Just by Chance then took to the stage to kick off the day's music and immediately the charisma and confidence of the duo is apparent. Playing through a mostly familiar set, the duo's guitar prowess is matched wonderfully by their near perfect harmonies. However familiar the mechanics of the acoustic duo, Just by Chance undeniably bring something fresh and distinctive with contemporary theme and rhythm underpinned by classic songwriting structure and harmony. I couldn't help but feel a little disappointed that they hadn't amassed the crowd they deserved, the long centre table occupied by a large family with seemingly little interest in the day's performances. Nevertheless, JBC played wholeheartedly to those who had come for good music, interacting well with the small audience between songs, sharing jokes and banter, injecting a warm and social connection. 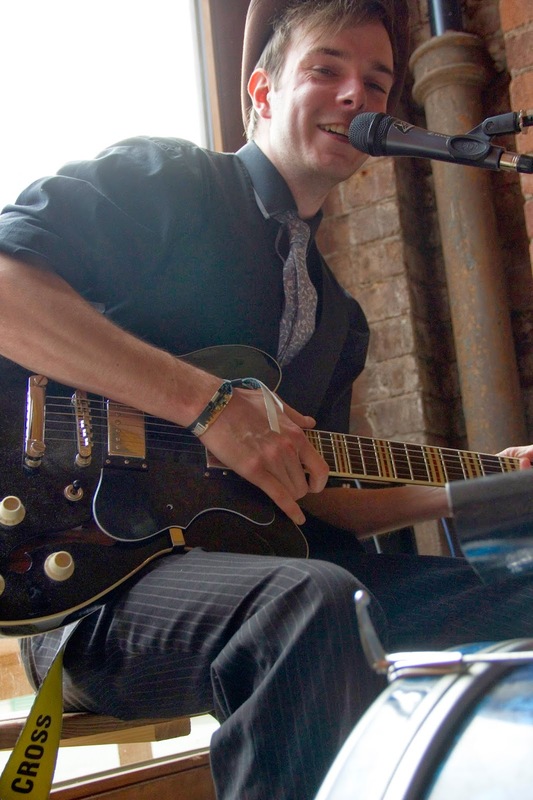 Next were the demure stylings of singer songwriter Karl McCann, dressed all in black with a guitar to match. Playing through a relatively sombre set it certainly drew attention, with a strong vocal performance underpinned by an undeniable sense of fragility. My first sight of North Wales' 'contemporary acoustic dance fusion specialists' Hedge Gods, was bass player Will's spectacular dreadlocks, as long almost as I am tall. Alongside Darren, the heavily drum laden percussionist and comparatively empty handed guitarist James, the trio arrived at the venue to set down their instruments before standing to appreciate the acts that would precede them. As they hit the stage I was a little unsure what to expect, but with the opening bars of their first piece, amazed glances were shared all over the venue. Their sense of rhythm and band chemistry captivated the now more focused audience as they bounced from one fun-filled number to the next. With song titles such as Cockney Geometry and Selfish Shellfish, it's immediately clear that Hedge Gods aren't guilty of taking themselves too seriously and that lightheartedness was infectiously shared with the venue who was soon stomping and clapping along. I had the opportunity to speak to percussionist Darren for a short period over a cigarette, and was stunned to hear that the band had only been performing together for a little over 12 months. I understood almost immediately that Hedge Gods were a band of individually talented performers that had a deeper understanding of a band's performance mechanics. The Hedge Gods were a truly unique experience, and the lack of preceding history with the band's music made it all the more, a defining moment of the weekend. Threshold all in all had been an incredible and eye opening experience, and a monumental success for Chris, Kaya and the inexhaustible Threshold team. Bringing a city together as the festival did is no small feat, uniting the musicians, the artists, the performers and their respective audiences in a truly homegrown sense, but it is a feat that has been accomplished flawlessly. Even though the experience has opened up my world to myriad local artists and performers that play the city year long that I am sure to take advantage of, I simply cannot wait to experience the Threshold vibes all over again next year.